In most cases, disaster and destruction go hand in hand. This is especially true if you are planning for natural disasters such as hurricanes, earthquakes, and tornados. Given that your home is your fortress and your main source of protection against disasters of all types, it is essential that you have a plan in place for repairing any damage that your home incurs during a disaster. Below, we’ll take a look at the top home repair supplies that you will want to stock up on in order to prepare for large-scale disasters. Why Stock up on Home Repair Supplies Ahead of Time? Since you don’t know what type of disaster you’re going to be struck with and what type of damage it will cause, it may seem more prudent to wait until you assess the damage before purchasing the supplies you need to repair it. In a perfect world, this would be the ideal solution. 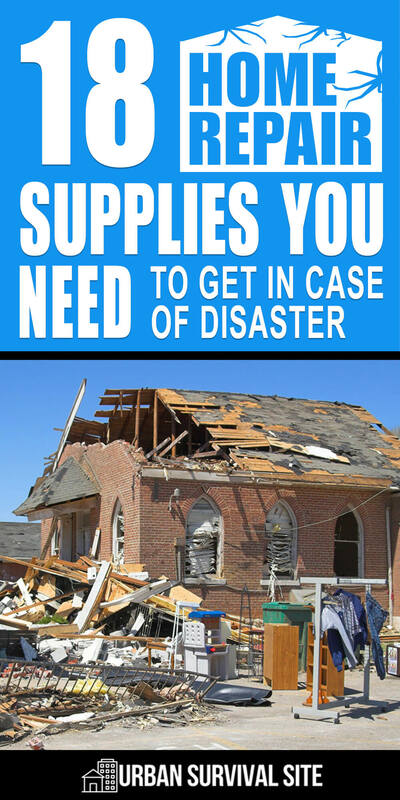 The reality is that sourcing supplies after a disaster is often easier said than done. Large-scale disasters such as earthquakes and hurricanes can grind entire counties to a halt, shutting down businesses and potentially leaving you unable to exit your home. If that happens, going to the store for supplies might not be an option. Even if it is, many crucial supplies might already be sold out. Of course, repairing things such as broken windows and doors after a disaster is incredibly important, both to protect your home against the elements as well as to protect it against looters that are commonplace in the pandemonium that follows a massive disaster. If you want to ensure your home remains safe and secure, you’ll need to have the right supplies on hand to repair it at a moment’s notice. From boarding up windows to repairing a broken wall, almost every DIY home repair project will require a power drill. While you could use a screwdriver instead, a power drill is going to make for a much quicker, more professional job. The Black+Decker LD120VA is one of the most popular drills on the market today and comes with a wide range of drill bits so you’ll be able to handle any type of repairs. If you need to use nails instead of screws for your repairs, you’ll need a quality hammer. A nail gun is another option that may save you some time, but, for most projects, a hammer will be more than enough tool to get the job done. The Estwig hammer is one high-quality option that is forged from a single piece of steel for maximum durability, but there are certainly plenty of other good hammers for you to choose from. Natural disasters will often lead to trees falling on your home. Before you can even begin to repair the damage that these fallen trees cause, you’ll need to get the tree itself out of the way. To do that, cutting up the tree with a quality chainsaw and moving it piece by piece is the best approach. The Husqvarna 455 Rancher is a well-built, gas-powered chainsaw with a 20-inch bar, making it more than enough tool for most any project. If you would prefer to purchase a battery-powered chainsaw instead, there are several great options available including the DeWalt DCCS670B Flexvolt chainsaw. The 16-inch bar on this chainsaw makes it a little smaller than the 455 Rancher – as most battery-powered chainsaws are – but it’s still a plenty powerful enough for most jobs. A chainsaw may be ideal for cutting up tree limbs, but it’s not going to be the best tool for cutting boards to length when clean cuts and smooth edges are desired. For cutting up boards to repair your home, the best tool for the job is a quality circular saw. The DeWalt DCS391B is one of many fine circular saws for sale and is an incredibly popular choice for professionals and DIY craftsmen alike. Since this saw comes with only one blade, you’ll want to stock up on a few extras since circular saw blades will not perform nearly as well when the blade is dull. A reciprocating saw is a versatile tool that has a wide range of uses, from cutting up pipe to cutting drywall and beyond. In many ways, this tool bridges the gap between chainsaws and circular saws, serving as a multi-use saw that can tackle all the projects where the other two fall short. The Black+Decker BDCR20B is one of the most affordable reciprocating saws that you will find given its quality, and it’s certainly a saw that is well-worth having around. A ladder may not be the first tool that comes to mind when you think of repair projects, but it is an essential one – especially if you live in a multi-story home. The Little Giant 14016-001 is a 22-foot ladder that should enable you to easily reach any area of your home that needs to be repaired. For jobs such as hanging up plastic sheeting where nails and screws are overkill, a staple gun will be ideal, enabling you to make light-duty repairs without putting large holes in your wall. We recommend the Bostitch T6-8 for its quality and price, but there are plenty of other good options. If you need a little extra leverage for a job, a crowbar is invaluable. When it comes to crowbars, bigger is better, so we recommend you check out the Stanley 55-104. This 36-inch crowbar is one of the largest available in its price range and should give you all the leverage you need for any job. If you need to make electrical repairs, you’ll want to have a quality pair of wire cutters available. The Irwin Vise-Grip Multi-Tool Wire Stripper/Crimper/Cutter is a quality, versatile tool that should enable you to tackle most any electrical repair project. For applying silicone or caulk to seal your repairs and keep the elements out, you’ll need to use a caulk gun such as the Newborn 930-GTD. Plywood is a staple of DIY emergency repairs, enabling you to quickly create a barrier over broken windows, holes in your wall, and more. Even if you stock up on nothing else, having a few sheets of plywood available for disaster repairs will go a long way. For repairs that require a little bit sturdier construction, 2×4 boards will often be ideal. Put a few full length 2×4 boards in storage so that you will have them in case you want to add some extra strength to your repairs. Remember, as long as you have a circular saw or a reciprocating saw, you’ll be able to cut them down to any length you need. Plastic sheeting may not keep looters from coming through a broken window, but it can keep out the elements while you work on a sturdier repair solution. A staple of DIY repair, duct tape has a wide range of uses when it comes to home repair. Use it to hang up plastic sheeting, temporarily fix a broken pipe, and more. You’ll want to have a wide assortment of screws, nails, and staples available to use for your repairs. If you want to keep water out as well as keep your home as insulated as possible, you’ll need to seal the edges of the repairs that you make with caulk. For plumbing repairs, you’ll need to purchase a range of plumbing fittings and extra pipe that you can cut to size using your reciprocating saw. Just be sure to check the size of the piping in your home before you make your purchase. A damaged roof can be repaired using a combination of tarps and plywood in order to keep water out. Plastic sheeting can be used as well, but tarps will be more durable and quicker to apply since they are much larger than plastic sheeting. Tarps also have a wide range of other uses and are really a quite versatile supply to have available in case of a disaster. What about hand tools for when the power is off? I’d hate to try using my reciprocating saw to cut a plywood board by hand. For plywood, I think your best bet is a good hand saw. Get one with a lot of teeth so you can make a smooth cut.